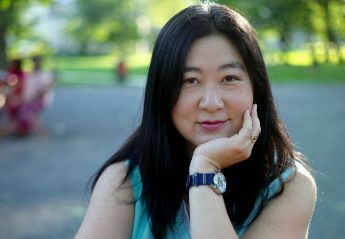 Jennifer Sheffield of Big Blue Marble interviewed Lorrie Kim for the July 30, 2016 release party of Snape: A Definitive Reading. The full text is on the bookstore blog. What kinds of insights have you gained about the series from other people’s presentations? I have such clear memories of moments when other people’s arguments inspired me. I mention a couple of them in the book. For example, in 2009, I heard psychologist Mara Tesler Stein explain that a Patronus is a mirror of one’s most loving self, and that when Harry first attempts to cast one, he can’t because he’s using the wrong kind of memories. When he uses memories of loving connection between people, the spell works. That stunned me – there are right and wrong kinds of memories for happiness spells? It opened my eyes to the way Rowling uses magical imagery to express psychological truths. It made so many readings possible to me. It helped me understand that when Rowling shows people emanating silvery magical light, it has to do with their individual selves – she might say “souls” – but when she shows golden light, it’s about the glow that comes of love between people. Which helped me understand why the dome of light between Voldemort and Harry is golden, and how that threatens Voldemort. Which made me think about wand cores connected through golden light, and how Harry and Voldemort are similar at the core. Which made me think about Hufflepuff colors of yellow and black, which gave me the notion that one trait of Hufflepuffs is that they believe we are all the same at the core. This cascading effect of mental connections happens to me so frequently when I listen to other people’s presentations based on a text we have in common. I know I’ve had similar reactions listening to Hilary K. Justice or Mark Oshiro. It doesn’t necessarily mean I agree with that person’s readings, just that their way of seeing illuminates something for me and brings more and more understanding. Book Jawn Podcast Ep 33! Book Jawn Podcast interviewed Lorrie Kim about Snape: A Definitive Reading for their Episode 33, which is appropriate since Snape’s grand reveal, “The Prince’s Tale,” is Chapter 33 of Harry Potter and the Deathly Hallows! Listen for an hour and a half of talk about trauma, the boggart incident between Snape and Lupin, Gryffindor/Slytherin bias, and more! Snape trivia! Go, Team Snape! On July 30, the night before the midnight release of Harry Potter and the Cursed Child, Big Blue Marble Bookstore will host a release party for Snape: A Definitive Reading. Events will include three rounds of Snape trivia, HP-themed prizes, a Snape cake, and an animated discussion about Snape, Slytherin, and Gryffindor. Snape trivia teams can choose a paddle to hold up for their answers! Choose from Puppet Snape, Coffee Snape, Movie Snape, Banana Snape, Pumpkin Snape, Reading Snape, Window Snape, Book Snape, and Robe Snape. So many Snapes. Can’t find quite the Snapey merchandise you want? Order your own, using your art or art from one of the many talented artists in fandom! Artscow.com offers printing on clothing, mugs, umbrellas, stationery, cosmetic bags, shower curtains, and other household items. They ship from Hong Kong, so if you live in a different country, watch for their frequent offers of free shipping. I tested out the images of Snape presented in the Rogue’s Gallery post to see how well they would reproduce on a notebook. Quite well, it turns out. Please excuse the glare from the glossy finish. Notebook front cover: book cover. Notebook back: art by Fox Estacado. Notebook inside cover images: Wit-Sharpening Potion by Shocking Blankets and Snape-shaped Hole by Liz Mattison. In a family of overachievers, one sibling outshines them all. Ronald Bilius Weasley leapfrogs over mere curse breakers and dragon tamers to take his place alongside Merlin, Circe, and Dumbledore as one of wizardkind’s all-time greats, worthy of a Chocolate Frog card. At the 2014 Chestnut Hill Harry Potter Conference, Tolonda Henderson posed the question: Why does no one write about Ron? Through studying his characteristic responses to poverty, oppression, envy, and his own privilege, we can see that Ron’s lack of leading-man status is actually one of the indicators of his greatest gift: a genius for the power of partnership. Delivered at the Harry Potter Conference at Chestnut Hill College, October 16, 2015. Emma Grant moderated a “Sorting Hamilton” panel at Leviosa that featured Heidi Tandy, Rachael Vaughn of Snapecast, and me. I love Emma’s model for live sortings: she designates different corners of the room for different Houses, and when she says a character’s name, you move to the corner that represents the House where you think they belong. Then there is discussion, and if you change your mind, you move to another corner. Sometimes you stand between two or more Houses. Emma started by asking the panel: Why do we Sort in fandoms that are not HP? We talked about how useful the Sorting model is for understanding characters and real people, and how Lin-Manuel Miranda is one of us: a creator in a post-Harry Potter world who incorporates HP models, allusions, and assumptions into his own work. For example, he has said that he modeled Hamilton’s introduction to first Burr, then friends Lafayette, Laurens, and Mulligan, after Harry meeting first Draco, then Ron and Hermione in Sorcerer’s Stone. Emma had the panel model a discussion on where we would sort Hamilton. Then she had the attendees sort Hamilton and as many other characters as we could in that time. Sometimes, you just can’t help the hate. But as much as they loathed each other, Sirius Black and Severus Snape were similar: brilliant, immature, dangerous men with ruined lives who gave those lives willingly to protect Harry. Both kept Harry’s parents’ love alive and delivered it to Harry as his birthright. Both knew themselves to be working for good despite being hated. Both died knowing the good in the other. They have so many parallels in canon that I will be reading from the page to make sure I don’t miss the most important ones before moving into a deeper reading of their canon dynamic. Snape and Sirius were opposites as mirror images are opposites, allies in war on the same side yet separate from each other and equidistant from the center like a king’s knight and a queen’s knight in a game of wizard chess, the best friend of Harry’s father and the best friend of Harry’s mother. Sirius was characterized as magnetic, Snape as repellent. Getting them to work together was like trying to force together the similar poles of two magnets and feeling their inexorable mutual aversion. Snape taunted Sirius as Slytherins taunt Gryffindors, harping on his frustration in captivity and his shallow self-control. Sirius’s aggressive energy was represented by knives: the knifing of the portrait and the gift he gave Harry, the knife that could open any door. He broke into and out of places: Hogwarts, Azkaban, Gryffindor tower. An introverted Slytherin, Snape cared desperately about reputation but had to maintain a strategically unsavory cover. Sirius taunted him for his pathetic outer appearances. Snape’s impermeable self-protections were represented by the locked room in the Department of Mysteries that contains a force more powerful than death. Nothing got secrets out of Snape except love. As an adult, Snape was defensive but magnificent, holding classrooms spellbound, intimidating Death Eaters. Sirius was born to a pampered life but turned out to have no self-pity or vanity. Harry grieved to think of him “crouching in a cave and living on rats,” but even under subsistence conditions, Sirius fulfilled his godfather duties from afar, tracking politics, free and beholden to nobody. Neither man cared for material wealth. Sirius valued objects only as tools to enable freedom and friendship: brooms, motorcycles, mirrors. Snape contained all of his treasures within his own mind. “[Karkaroff] showed Snape something on his arm?” said Sirius, looking frankly bewildered. Both were anti-patriarchal. They were the last of their family lines and could not have cared less about patrilineage. Sirius was blasted off the Black family tree and Snape privately identified with his matronymic. Sirius assigned no sentiment to Black family heirlooms. Slytherin’s locket was worth ten Galleons to Merope Gaunt, more than her own life; it was priceless to Voldemort, but rubbish to Sirius. Like Harry, Sirius treasured love, not gold. Snape came from working class folk; his treasures were the books and stories he inherited from his mother, including her prejudices. The first encounter between Snape and Sirius, first-years on the Hogwarts Express, packs a remarkable amount of background into a few short passages. Sirius’s new friend James insults Slytherin. He grinned? Right after that worrisome comment from James? He came to Hogwarts, then, already with inner confidence. Snape came to Hogwarts already defensive, scornful. Maybe this scrawny child used to comfort himself that bullies were stupid. That defense won’t work anymore. How could Sirius be so sure that Snape isn’t brainy? Lupin told Harry, “Your father and Sirius here were the cleverest students in the school.” Cleverness might have been a defense for Sirius, too, then. Sirius might have comforted himself by thinking that the despicable Dark wizards he knew were less clever than he, which was generally a good bet. Both Snape and Sirius were characterized by arrested development. Snape’s espionage post required him to relive his teens and young adulthood constantly. He behaved disgracefully as a teacher. Sirius, already reckless by nature, never developed adult ability to assess risk. He seemed to remember only his teen adventures, not the grimness of his early adult years. So, what happens when we take these overgrown children into Harry’s story? This immaturity proves to be a blessing. Dumbledore really is too old to understand Harry – or Sirius, or Snape. He has forgotten how it feels to hate. Dumbledore doesn’t know how Harry feels. Sirius does. Snape, too, knows to break Dumbledore’s orders and connect with Harry during Occlumency. “That’s exactly what he thinks you’re doing,” said Sirius. These two remember what a 15-year-old can handle. We can track the dynamic between Snape and Sirius in five adult confrontations: four face-to-face, one symbolic. That’s the emotional baseline for Sirius, just out of Azkaban. After 12 years fighting dementors, he’s stalled at adolescence, less mature and more vengeful than before incarceration. To expect maturity is to dismiss his towering achievement in keeping his mind at all. Maturing is a luxury. Snape has had the privilege of life on the outside, the opportunity to learn more self-control. He threatens to kill Sirius at wandpoint – but gives him a warning: “Give me a reason to do it, and I swear I will.” We don’t doubt it: he believes Sirius is trying to get Lupin to bite Harry while transformed, the same set-up that once nearly killed him. When Snape is knocked out and Sirius levitates him out of the Shack, Harry notices that Sirius kept bumping Snape’s “lolling head,” intentionally. When Harry goes back in time, though, he sees that Snape handles the unconscious Sirius neutrally. No one was watching; Snape could have exacted petty revenge, but he didn’t. Snape has been tempered by freedom and responsibility for others. Once Sirius takes on responsibility for Harry, he, too, gains some temperance. Goblet of Fire is the best year of Sirius’s adult life, even while starving and filthy. He’s at his most impressive, delivering astute strategic counsel. We can see why he was considered a top student. That year, Dumbledore says: “It is time for two of our number to recognize each other for what they are. Sirius . . . if you could resume your usual form.” Sirius turns from a dog back into a man. Snape is revealed as a former Death Eater who has only been pretending to be untrustworthy. Dumbledore orders them to shake hands: “I trust you both. It is time for you to lay aside your old differences and trust each other.” If we look very closely, we will see that both did make an effort. Their worst confrontation took place when Snape came to tell Harry about the Occlumency lessons. On one level, this spat is cringeworthy. Sirius calls Snape “Snivellus,” like they’re first-years. Snape mocks Sirius for living in his mother’s house. On another level, it’s understandable that both are provoked. Snape was just delivering news from Dumbledore, but Sirius kept escalating. Sirius was responding to Harry’s visible distress. Extra lessons with Snape — what on earth had he done to deserve this? He looked quickly around at Sirius for support. Snape made Harry afraid of him, then claimed that Harry was “so arrogant that criticism simply bounces off him.” Any guardian would be upset. And then Snape said “softly” that when Sirius defied orders and left the house as a dog, Lucius Malfoy recognized him. On the most basic level, Sirius was trying to say, “You’re tormenting my kid. Stop it.” Snape was trying to say, “You’re putting us at risk. Stop it.” They were trying to work together, but they knew each other too well. Harry asks Sirius and Lupin about the Marauders bullying teen Snape. “I’m not proud of it,” said Sirius quickly. That’s a change from “Served him right.” It registers with Lupin, too; the next paragraph begins, “Lupin looked sideways at Sirius.” It’s a tiny but important moment. We don’t know how long Sirius privately recognized his bullying for what it was. Sirius might not have acknowledged it without the impetus of responsibility for a young one. We learn later that they communicate by Patronus. A Patronus cannot lie. Before Sirius died, Snape spoke to him with his most authentic voice. Harry “clung to the notion” that “Snape’s snide remarks” had goaded him, but even Harry probably knew that wasn’t true. Snape genuinely needed Sirius to staff headquarters and stay safe. He’d intended Sirius to survive. Sirius rushed off because he could not endure the threat to a child under his protection. We see Snape doing the same: Rushing off when Montague turns up, leaving his worst memory in the Pensieve. Hurtling into the bathroom to heal Draco from Sectumsempra. Uncle Vernon’s and Harry’s eyes met. Harry was sure that in that instant they were both wondering the same thing. I’m guessing Snape’s enmity for Sirius was closer to the way Harry and Draco loathed each other but thought each other worth saving. In the Department of Mysteries, we see the central image of the Snape/Sirius dynamic. Harry and his friends encounter a door they cannot open. Harry remembers that Sirius gave him “a handy penknife with attachments to unlock any lock and undo any knot.” But when he tries it on the door, the door melts the blade. The Locked Room’s secrets are sealed by protective love, and not even the master of break-ins and break-outs can overpower it. Sirius had his own ways of sealing his mind. He and Snape both knew how to fight dementors without a Patronus. We know that Harry “disagreed with Snape on the best way to tackle dementors.” Rowling never tells us Snape’s way, although we can guess that Snape argued for nonverbal, undetectable techniques. About betraying Lily and James, Sirius had a clean conscience, so he could resist the dementors, as Snape was able to resist Mad-Eye Moody’s Dust!Dumbledore. But Fred and George sent Montague into weeks of terrifying limbo that nearly killed him. What’s the difference between Fred and George being thought funny and teen Snape telling Lily that Mulciber and Avery were just having a laugh? It can be argued that the difference is intention: Dark Magic is worse. But what if teen Snape had died? Or Montague, or Draco, or Ron, or Katie Bell? When Ariana died, Dumbledore didn’t want to find out whose spell hit her, as if that would make any difference. But it does. It tears at your soul when someone dies because of something you did. If the victim survives, you can feel remorse, as Harry does after Sectumsempra. Or you can disown responsibility, like Sirius when Dumbledore, as far as we can tell, did absolutely nothing about the Marauder prank. Dumbledore’s inaction made it that much harder for Sirius to mature. Harry never even opened the last gift Sirius gave him. After Sirius died, he found that it contained a two-way mirror that could have prevented the Ministry battle. Harry threw it in rage, creating the broken mirror shard that plays a major part in Deathly Hallows. Sirius had lost Harry’s trust. He had disobeyed orders and been seen. He had sulked like a child when Harry showed caution. Harry was so afraid of losing Sirius that their roles became reversed. Harry “felt that it was incumbent upon him to say something to Sirius to stop him doing anything stupid . . . He knew he would never use whatever it was. It would not be he, Harry, who lured Sirius from his place of safety.” Sirius hadn’t been seeing him fully, the child whom Sirius should have reassured. At Grimmauld Place, trapped with his childhood ghosts, Sirius regressed. His cold, dark eyes were boring into Harry’s, who met his gaze unflinchingly, concentrating hard on what he had seen in his dream, willing Snape to read it in his mind . . .
Harry and Snape knew how to go into Legilimency mode. Through their earlier Legilimency, Snape had seen what Sirius meant to a lonely child. It humanized Sirius for him. Sirius and Snape both loathed Voldemort, but withstood being reviled as Death Eaters because they had more important concerns. Sirius contributed to his own broken public image: people believed him capable of betraying James and Lily because he once set up Lupin to kill Snape. Snape had to do something similar: kill Dumbledore to make everyone, including his colleagues, believe him capable of any evil. Snape even deceived Hogwarts, which didn’t grant him a portrait when he died, the headmaster’s version of showing up in a mirror. Most importantly, Snape was invisible to Harry, who believed that with Dumbledore, “the last and greatest of his protectors had died.” Harry had one protector left, but by design and necessity, Snape didn’t show up on this scan. Given Voldemort’s Legilimency, it would have been disastrous if he had. Following Dumbledore’s death, it becomes harder to see correspondences between Sirius and Snape, but we find in Deathly Hallows that they remained associated via Phineas Nigellus Black and Regulus Black. Sirius’s great-great-grandfather, Phineas Nigellus Black, was the “least popular headmaster Hogwarts ever had.” In Dumbledore’s time, Portrait Phineas Nigellus traveled between the headmaster’s office and Grimmauld Place. After Snape became headmaster, Hermione stowed the Grimmauld Place portrait in her bag, retaining control over this line of communication. His personality resembles Snape’s; Harry felt “he was company, albeit of a snide and taunting kind.” He venerates Snape and calls Sirius his “worthless great-great-grandson,” but grieves when he learns that Sirius is dead. If he thought Snape, a fellow Slytherin headmaster, would share his prejudices, he was mistaken; Snape corrects him when he calls Hermione a Mudblood, much as Dumbledore might have. “I wouldn’t expect you to, Phineas,” replied Dumbledore, and Fawkes gave another low, musical cry. This tells us that unlike Slughorn, Dumbledore, or Snape, Black had never enabled a Dark Magic death and didn’t know that the prospect of atonement is one of the few ways to overcome that guilt. Regulus Black, too, combined some traits from both Sirius and Snape. A year younger, he appeared in photos as “smaller, slighter, and rather less handsome than Sirius.” Perhaps 11-year-old Snape reminded Sirius of Regulus, less brainy and less brawny. Regulus took the Dark Mark at 16, a year after Sirius moved in with the Potters. As far as Sirius knew, Regulus was killed by Voldemort for trying to leave the Death Eaters. Sirius never learned that Regulus sacrificed his life to defy Voldemort, as both Snape and Sirius would, but with even less guarantee of reward. Like Sirius and Snape accepting that they would not live to see their names cleared, Regulus swore Kreacher to secrecy to protect his family, ensuring that his own fate and heroism would never be known – not even to his mother. Just as Sirius saw Snape’s most loving self before he died, Snape recognized love in Sirius. When he needed a magical object to deliver love from Lily that would strengthen Harry for his final task, he went to Grimmauld Place. Like Sirius tossing heirlooms in a sack, Snape rifled through Sirius’s room, judging the contents “mostly, if not entirely, worthless.” Neither had use for anything except love. Snape found it: a letter from Lily bearing not romantic love, not even maternal love, but “Lots of love” for her friend. This mangy dog had loved Lily, too, and she had loved him in return. That was the treasure for which Snape braved one last return to Grimmauld Place, and he knew to look for it there.